I must admit, when I decided to enter my unit into indoor competition with Winter Guard International (WGI), I wasn't quite sure what to expect. "Would this be too much of a time commitment?" "Would my students enjoy competing?" "Would the parents be supportive?" "How would other band staff members feel about this activity?" These were just a few of the questions bouncing around in my mind. Though I had somewhat of an idea about the time commitment and some of the problems involved in competing (through observing other indoor competition activities), I did not foresee how the positive benefits would impact my percussion program. The number one positive benefit on my list is the parental involvement my program enjoys. Maybe it is a comment at our society; but since we started competing, parental support has increased. "This is our way of spending time and being close to our children without them realizing that we, as parents, are around them." This is the comment I hear several times from the percussion parents. The percussion parents are more willing to chaperone, fundraise, provide meals, make phone calls, take trips, host contests, communicate, publicize and sit on school board meetings to support the percussion program. 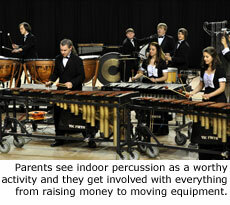 The parents see indoor percussion competition as a worthy activity. They like the qualities they see developing in their children. The percussion parents comment on how the members of the percussion ensemble pull together like a family. The parents like this because they prefer their child "hanging out" with dedicated, focused students. Older students take underclassmen under their wings. Many of my percussion parents have commented that their child's attendance and grades have actually improved since their child became involved in the percussion program. The parents see their children working toward goals, working with other students to achieve those goals and organizing their time so those goals can be achieved while they, the students, maintain good grades in all their classes. My percussion students' attitudes and work ethics have improved tremendously. Competing every weekend and, more importantly, being evaluated on their performance every weekend, has helped my students to raise their level of performance. While we always work to excel, competition has helped us set new standards within our program. Preparing compositions for competition has taken us further than preparing compositions for a performance for the "home folk." My students' attitudes and work ethics seem to improve with each competition. With our state indoor percussion association (Indiana Percussion Association) growing, my students are now competing with students they know from other local programs. This is good motivation for them. This improvement in attitude has had a trickling effect within my program. The middle school students are now ready to be a part of a dynamic program and they understand the expectations of the group. New members are joining the program each year with better and better attitudes. Every program has a group of students who don't practice and just seem to be taking up space. Each year I have fewer and fewer of that kind of student. I can easily justify an increase in instructional time since we, "have to practice more, we have a contest coming up" (the line I use). What my students may not realize is I use this time to slow down the rehearsal and thoroughly teach percussion concepts. We typically teach marching percussion concepts, some Latin techniques and concert band percussion techniques as needed. All members of the ensemble were exposed to more instruction on: timpani technique and tuning, various four-mallet grips and their usage, mallet technique, triangle technique, tambourine technique, concert snare technique, vibraphone damping technique, balance adjustments created by different performance venues, mallet selections, etc. As mentioned earlier, student academic achievement is on the rise for members of my percussion program (over 50% are on the high school honor roll). We do not accept the "dumb drummer" stereotype. How has indoor percussion competition affected their grade achievement? First, I explain to them many teachers see how much they are practicing after school. If their grades fall, we may be asked to cut back on our practice schedule. Second, the focus they learn while preparing and performing can be applied to any challenge they may face in life. This includes homework and tests. A weekly cassette tape evaluation from adjudicators has benefited my program. I view each tape evaluation as a mini clinic by the judge. The tapes and comments have allowed us to go beyond our perceived abilities to become better than we thought possible. The tapes challenge us to overcome hurdles and make our show better. Before we even get to the first contest, the judges have helped us. We play a little game. The game is to see how much time passes before the judges make a negative comment. The judges' comments will help us focus on particular problems within our show. The comments are very helpful near the end of the season when I can feel my "well" of ideas beginning to run dry. Concepts learned from the judges are applied beyond our competition show to all aspects of our percussion program. We are much better equipped since we began competing. Instruments we could have "just gotten by with" are no longer acceptable. Parents are now more receptive to the statement, "you are only as good as your drum." Parents are now more willing to raise funds to replace instruments. The equipment we have obtained for our indoor percussion unit can be used by several different ensembles in our school system. By acquiring more percussion keyboards, it is much easier to prepare for our state solo & ensemble contests. For myself, taking my ensemble to competitions has been a great opportunity to communicate with other percussion directors. We network, share ideas, ask questions, give each other a hard time, swap recipes, evaluate each others' groups and generally encourage each other. My circle of contacts has greatly increased and continues to increase through indoor percussion competition. The networking has greatly aided in my growth as an educator. If you are saying, "This is all great, but how has it really benefited your program besides filling your office full of trophies?" "How is the education of your students better?" The level of playing we achieve through competition is applied to all music and concerts we perform, whether the performance be a mallet quintet performing a Becker arrangement of a George Hamilton Green rag, a sleigh bell part on a Christmas concert, or a swing beat in jazz band. Dennis DeLucia once asked me if my group was better now as a competing ensemble than before they started competing. My answer is "Yes." Three months later in February, as my group was polishing up their competition show I made the statement to my percussion students, "Who would have ever thought percussion could sound like this?" They were playing Appalachian Spring, arranged for percussion ensemble! They were playing it so well, it was difficult to tell them exactly how I felt without becoming choked up. Thinking back to the state of my percussion ensemble before we began competing and listening to how far we had come was very emotional. We have performed in many non-competitive venues such as school concerts, percussion clinic days, state conventions, radio programs and community events. These performances have taken us far, but none as far as the competition circuits we have participated in throughout our state circuit and competing with Winter Guard International (WGI). About the Author: Daniel P. Fyffe is the Director of Bands for Franklin Central High School (Indianapolis, IN) and the creator of the Franklin Central Percussion Symphony. He received his Bachelor of Science Degree in Music Education from Ball State University, his Masters of Science Degree in Music Technology from Indiana University and has taken post-graduate coursework at Indiana University. Dan is endorsed by Pro-Mark and is the designer/consultant of Pro-Mark's new line of scholastic mallets, the Prodigy Series. He is also endorsed by Evans, Dynasty and Sabian. Dan's percussion arrangements are published by drop6 media of Dallas, Texas. Dan is a past president of the Indiana Percussion Association and a member of the Percussive Arts Society. The Franklin Central Percussion Symphony is the 1998, 1999, 2000, 2001, 2002, 2004 WGI Scholastic Concert World Class Champions, as well as the 2005 WGI Marching Scholastic Open Class Bronze Medalist. 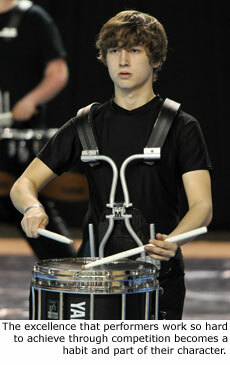 In 2010 he was named to the WGI Hall of Fame. 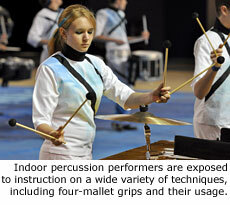 For more information on WGI Sport of the Arts, visit WGI.org. Article and author photo courtesy of WGI and reprinted with permission. Additional images by Marching.com.